Who is the Cambridge House Grammar School whistleblower? 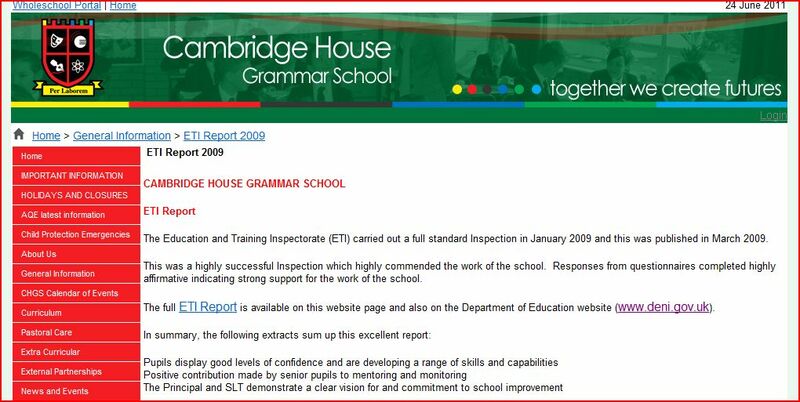 Why have the ETI, the Schools Inspctorate, been called in at short notice to review Cambridge House and hastily place a grammar school in special measures? Check the ETI website http://www.etini.gov.uk/ and determine how often the ETI revisit schools – it is usually many years between visits. It has been suggested to PACE by well-placed sources that the DENI were contacted by a disgruntled employee at Cambridge House Grammar School. The Inspection visit was a consequence. Now consider the aim of Sinn Fein Minister, John O’Dowd to end grammar schools in Northern Ireland and the difficulties that Ronnie Hazzard, principal of Ballymena Academy, has incurred over the integrity of the GL Assessment exam used to determine admissions to Ballymena Academy, Slemish College and St Louis Grammar School. Only Cambridge House uses the AQE test and has remained unsoiled by the use of a suspect test. Minister O’Dowd is currenly conducting an investigation into the GL Assessment and PPTC debacle. 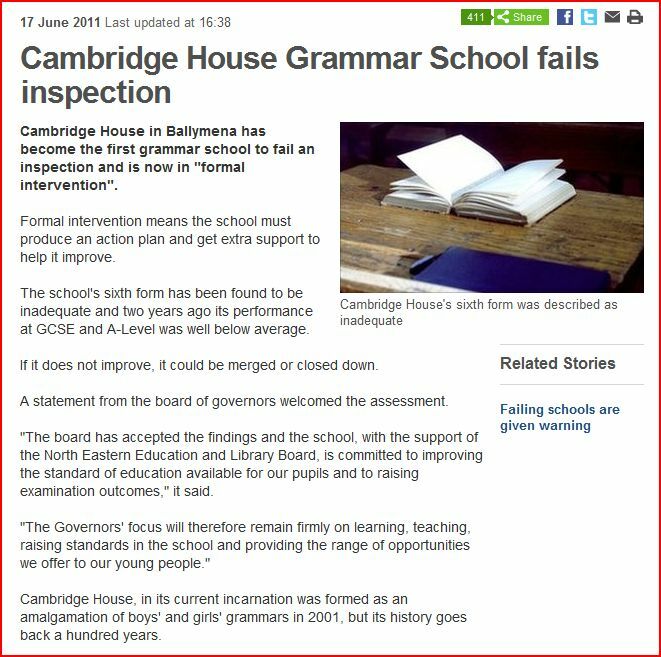 For those with an eye for detail notice that the BBC Northern Ireland Report on Cambridge House Grammar school is dated June 17th 2011. The ETI published the Inspection Report for public consumption on the 22nd June 2011 robbing parents and the Ballymena public of an opportunity to immediately respond to the BBC story. Parents may suspect that the Northern Ireland media are a mere extension of the DENI’s publicity/propaganda machine. The NGSA was formed in the 1970s. It is a non-political, not-for-profit organisation supported by parents, school governors, heads, teachers, educationists and others, all concerned with the retention and promotion of the UK’s grammar schools as a valuable choice for parents. Interestingly almost all of the 69 grammar schools in Northern Ireland declined an invitation to join this influential body when members of the NGSA co-hosted a symposium at Stormont a number of years ago and extended invitations to show strength in numbers. Perhaps local principals were already aware of the plans to destroy grammar schools in Northern Ireland and were cooperating fully with the DENI on implementing the rationalisation and comprehensive model. The roles of the former head of Methodist College, Belfast Wilfred Mulryne, Inst’s first female head, Janet Williamson, Ballymena Academy principal, Ronnie Hazzard and Neill Morton of Portora Royal School in Enniskillen are worthy of examination and critical review. Read the quote from Shaun Fenton , Head of the successful and popular Pates Grammar School to understand that principals may have conflicted positions and say one thing to government while posing a very opposite position to parents and governors. The descent into chaos for the Northern Ireland education system continues to plumb new depths. Many parents and their children are feeling the effects of the bends as they are dragged recklessly from regulation to deregulation and back again towards regulation. If parents are considering which test is offered by their school of choice then the answer may be one, the other or both! In December 2007, the Royal Belfast Academical Institution (Inst) was challenged on their polite platitudes towards socially disadvantaged local boys. The school refused to provide detailed answers. In addition their contradictory simultaneous support for the AQE test of numeracy and literacy and the CCEA Pupil Profile was laid at the foot of Sir Kenneth Bloomfield, Chairman of Governors. Again no clear response was provided. Bloomfield is a jockey out of many stables. 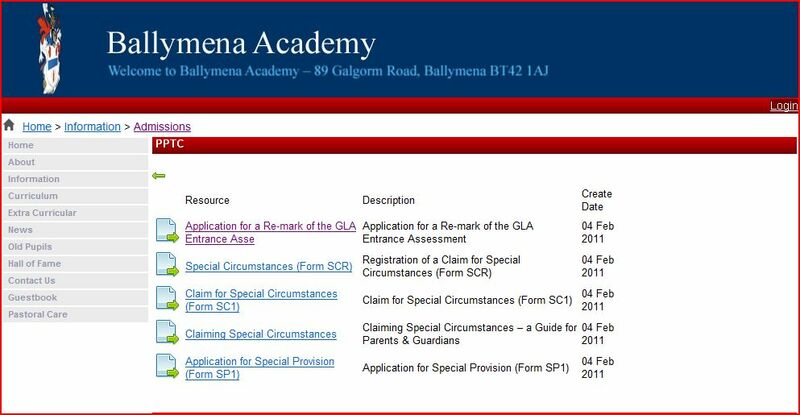 Recently Ballymena Academy published admission policy and aptitude test information for prospective pupils. This contingency plan for their “aptitude testing” would be implemented only in the event of an ‘unregulated’ transfer procedure – a hint of a possible move back towards regulation. The sample test items are clearly of the verbal reasoning type although the school do not indicate who provided their “contingency test” or who the chief examiner is. The guidance suggests should an acceptable alternative procedure gain the necessary support within the Northern Ireland Assembly, Ballymena Academy will comply with that procedure, their plan will not be implemented and parents will be advised accordingly. 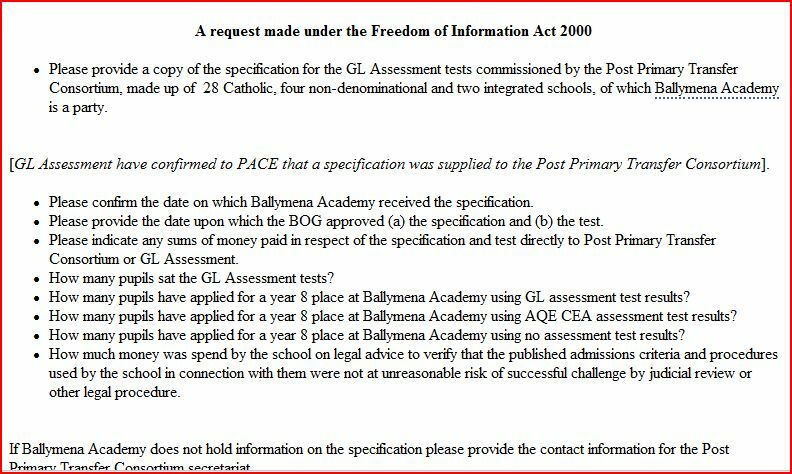 Perhaps the Ballymena “contingency test” is similar to that of the Catholic grammar Lumen Christi. One can only wonder at why 69 schools could not agree a testing approach based on numeracy and literacy. Perhaps Ms Slevin should make contact with the examining bodies for advice on how to equate the two tests. Did the board of governors of Victoria College actually consider the problem before offering the criteria to prospective pupils. Why have non-denominational grammar schools eschewed tests of numeracy and literacy in favour of a discredited obsolete verbal reasoning test? Parents are entitled to have answers. Just don’t ask Sir Ken.